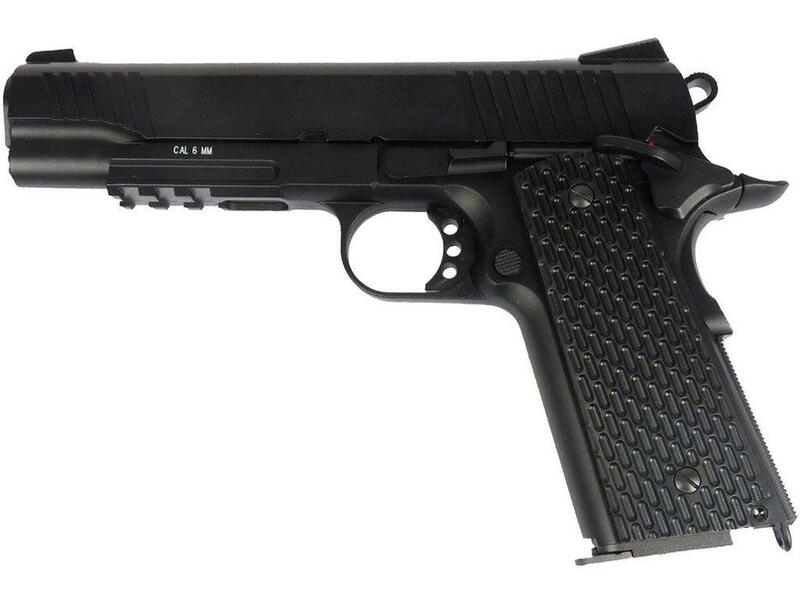 KWC Model M1911 A1 Tac Blowback CO2 Steel BB Pistol (Black) | ReplicaAirguns.ca | Easter Weekend Sale! Trigger Pull: The trigger pull on the KWC M1911 A1 Tac blowback BB Pistol is exactly what you would expect from a true single action 1911 styled pistol. It has a short take up and then a nice light and crisp pull to it. Because of the similar mechanics not only to the trigger but other aspects of this gun, it would make an awesome low cost trainer to be used when your real 1911 can not be. Accuracy: I shot the KWC M1911 A1 Tac BB gun at a target from 20 feet away in a semi rested position, and it performed well getting a 2 inch grouping just a bit off center of the target. The sights are adjustable for windage so zeroing the KWC M1911 A1 Tac in would not be much of a problem! My initial Chrony testing puts this gun right in the 300-320 fps range which is just fine for this style of heavy full realistic blowback action BB shooter. I also managed to get three very good magazine worth of shots with some extra CO2 left for a potential 4th magazine. If you slow your shooting down and let the gun and CO2 warm up between magazines you can get 4 magazines with this gun for sure. 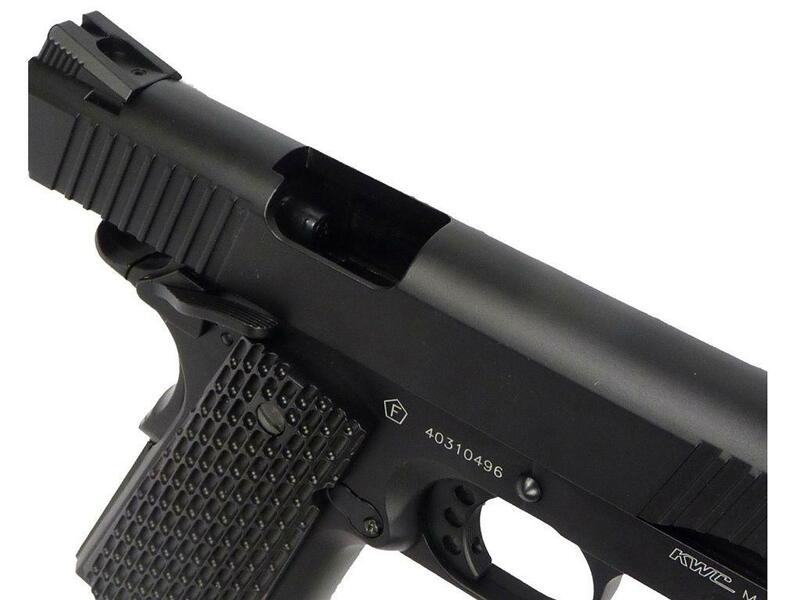 Build Quality: KWC did a great job with the KWC M1911 A1 Tac. 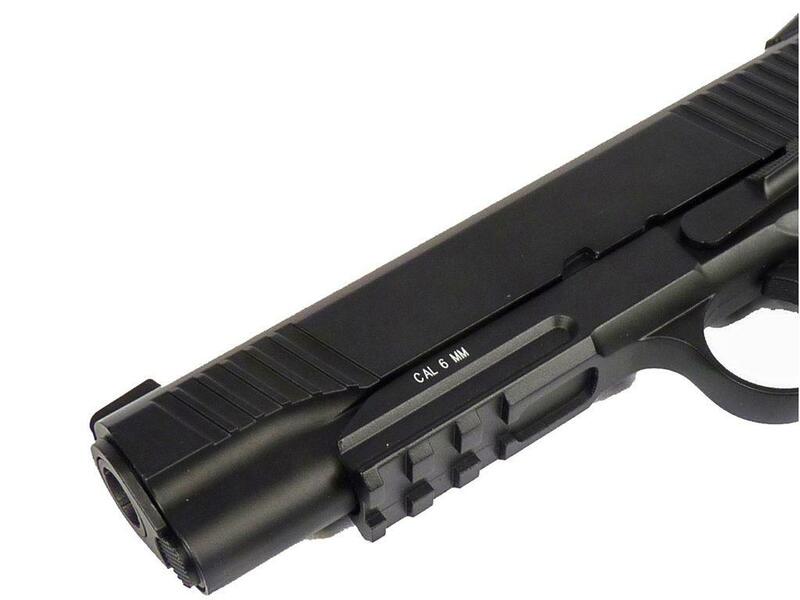 The quality and build characteristics may even be just a bit better than my other KWC/Cybergun blowback air pistols. Everything that should be metal is the same on this as the original, the slide and barrel wiggle are minimal and the finish seems to be wearing fairly well on this KWC airgun. I do expect over time fore some of the finish to wear off on the high points but this can also give the gun some character. Realism: The KWC M1911 A1 Tac BB airgun is as close as you can get to the real steel 1911 A1 45 auto but with an obvious more modern Tactical look to it, the Tactical version has the addition of a: Tac style trigger and hammer, textured grips, ambidextrous safety, adjustable white dot sights, rail for accessories. This gun is nearly all metal with very heavy blowback making it feel real to hold in the hand and shoot. Decent accuracy, not too bad amount off shots for this style of gun, about 3+ good magazines. Finish on the Cybergun and KWC guns can ware off on the high points a bit but some people like this look. Comments: I love the Cybergun Tanfoglio Witness 1911 as do many of you based on the amount of sales we have had on that unit! After all who does not appreciate such an accurate replica of the Classic Colt 1911 A1 45 auto? 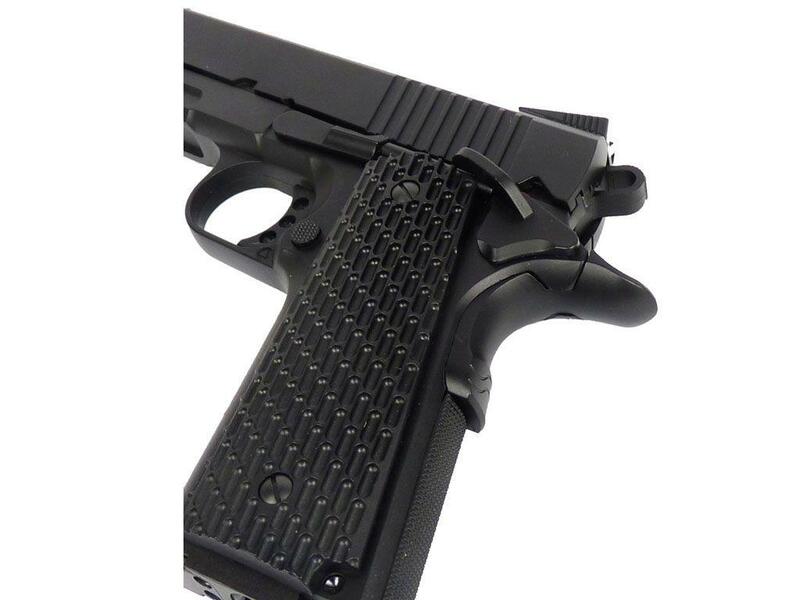 The only problem with the classic 1911 is that it is missing a few of todays more modern features and that's what is so nice abut the new KWC M1911 A1 Tac BB Pistol, it takes an already great design and makes it even better by adding the Tac style trigger and hammer, textured grips, ambidextrous safety, adjustable white dot sights and rail for add on accessories. So if you're a 1911 fan looking for as close as you can get to the real steel in a more modern version than look no further, this is it! 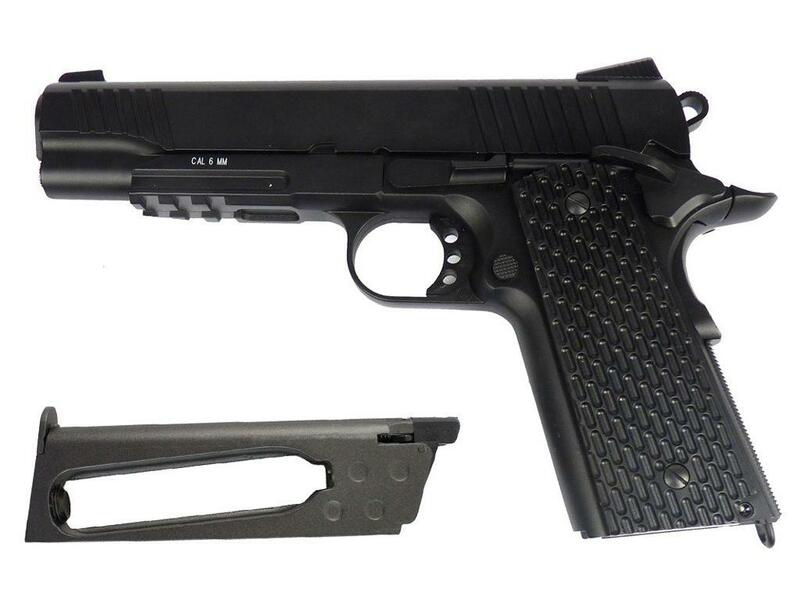 http://www.ReplicaAirguns.com - KWC M1911 Model A1 TAC CO2 Blowback BB Pistol Table Top Review. This video is a walkthrough review of the KWC M1911 Model A1 TAC CO2 Blowback BB Pistol. I show off the gun close up from all angles and point out the metal components and the incredible realism this airgun offers. I also show you (in first person perspective) my initial Field Test results shooting this gun through my Chronograph and at a target from 20 feet out. I love my Cybergun Tanfoglio Witness 1911 as do many of you based on the amount of sales we have had on that unit! After all who does not appreciate such an accurate replica of the Classic Colt 1911 A1 45 auto? The only problem with the classic 1911 is that it is missing a few of todays more modern features and that's what is so nice abut the new KWC M1911 A1 Tac BB Pistol, it takes an all ready great design and makes it even better by adding the Tac style trigger and hammer, textured grips, ambidextrous safety, adjustable white dot sights and rail for add on accessories. So if you're a 1911 fan looking for as close as you can get to the real steel in a more modern version than look no further, this is it!